The Parish started on 1991 as small prayer group under the Multi-purpose Hall. As the group increased in number it became outstation of St Joseph parish only from1997 the Church was constructed and Fr Harris Blamoh who was resident in Matadi became acting Paarish Priest under Fr Harris O’Brien. 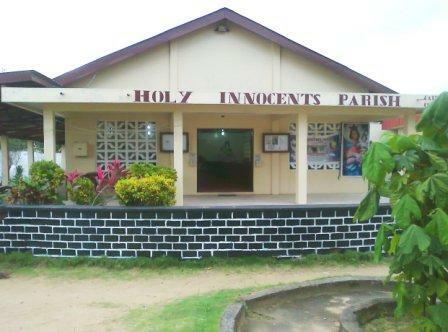 Holy Innocents Parish gained the Parish status on the year 2000, Fr Blamoh became the first Parish Priest and the Parish started keeping her own record such Baptism and Marriage Record. In 1999 Mr Michael Sowah (the actual catechist) has been assigned to do Pastoral Work upon completion of his two hear catechist training. TRANSFORMING THE SOCIETY IN A COMMUNITY OF LOVE.